Preliminary Listing More Details and Pictures To Come! The Viking Sport Cruisers 70 Motor Yacht delivers world-class performance while raising the bar to new levels of comfort and elegance. Boasting 4 staterooms with 3 ensuite heads plus a captain's quarters in the stern, a large flybridge, and a nice aft deck for al fresco dining. Two of the four staterooms are VIP-class which is fantastic for two couples traveling together. With a bow thruster, this 70-footer can be maneuvered easily with a little practice and a worked out plan between the captain and his first mate. Three One and One is a well-maintained motoryacht in beautiful condition. MAN 2000 hour services performed January 2019. Please contact Mark LaPrade, Central Agent at 727-501-5474 or email at mark.laprade@thundermarine.com for information or to set up a showing. Main Salon features a large U shaped sofa to starboard, opposite is a flat screen TV w/Bose home theater, (2) built in arm chairs to port & Sat TV w/reciever. Spiral stair case to Flybridge. Cocktail cabinet w/refrigerator, ice maker, bottle & glass storage.Telephone exchange system w/(2) shore connections w/intercom throughout vessel. Clock & Barometer low voltage over head lighting throughout. Full beam midship master stateroom with ensuite vacuflush head; walk through dressing area with large hanging lockers. Dressing table w/stool, large settee & built in night stands. Forward VIP guest stateroom w/ensuite head & shower, dressing table w/mirror, large hanging locker w/ample drawer space. Cockpit access to side decks, teak deck & extended swim platform, cockpit lighting, cockpit speakers, dockside water, transom shower, aft deck access to crew quarters & engine room, (2) transom doors & upholstered aft deck seating, starboard wing storage, & full wrap around canvas. 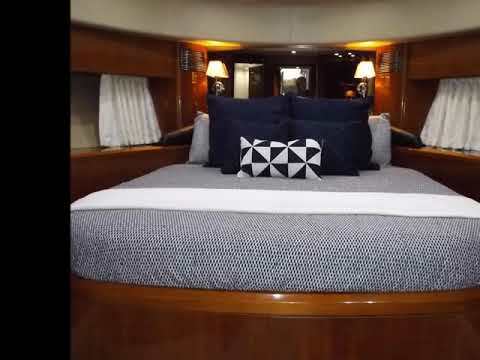 Flybridge access from salon & cockpit, wet bar w/refrigerated drink box, sink & grill, U-Shaped settee with table, helm & companion seats, hydraulically raised instrument console, Clarion AM/FM CD player with speakers, sunpad with storage, custom installed spare prop lockers, 880 # lo profile davit,complete set of canvas seat, and console covers, full size bimini top.